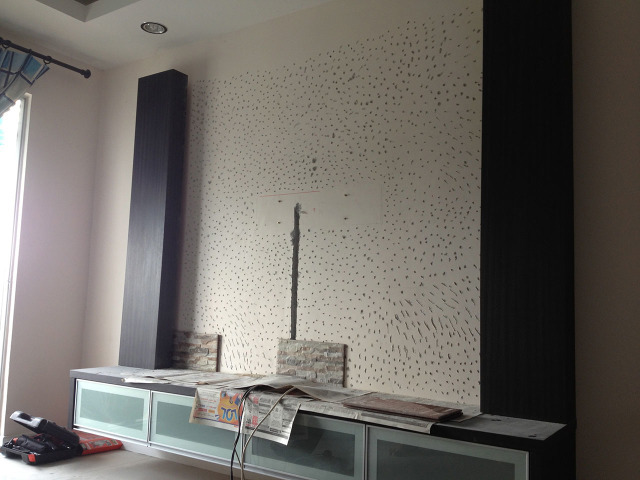 It’s 2 weeks already since the deposit for the TV Panel renovation has been paid, and no work done yet. 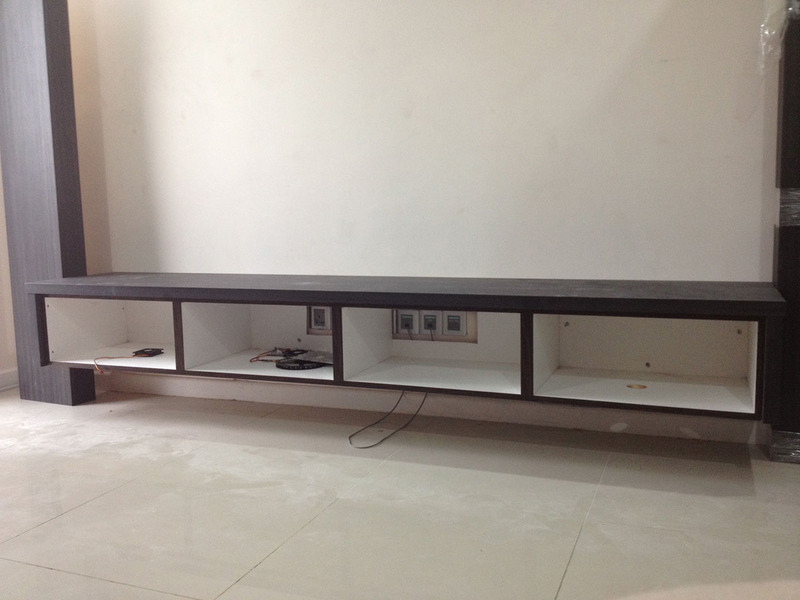 I understand that the tv rack has to be custom made and may take time to finish, but it seems that there is no news from the appointed contractor. 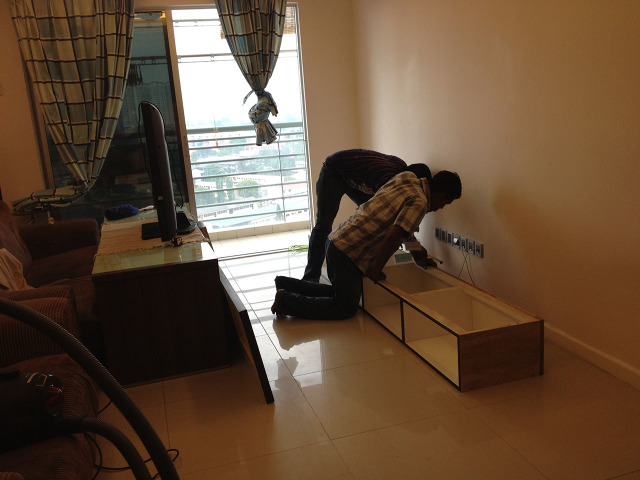 After making noise to the contractor, he finally told that the rack and the 2 pillar as part of the panel will be delieved on Wednesday, June 20th. 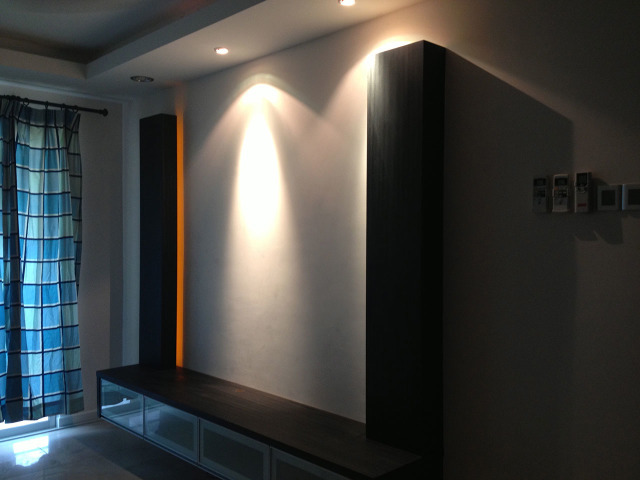 I just don’t know what have been communicated by the contractor to the supplier. 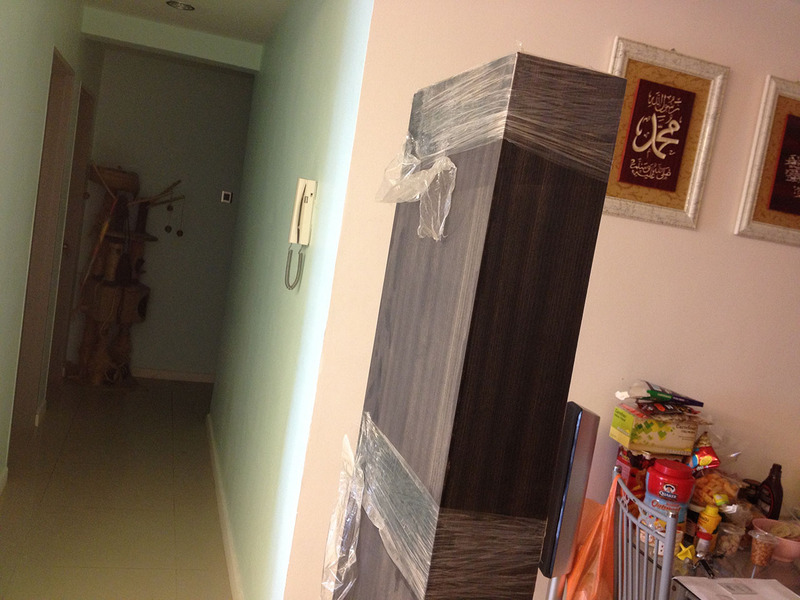 It seems that they are having difficulty of hanging this rack to my wall today as according to the guy that came, the size is not standard. They also suggested for the leg to be installed due to the size for not being standard. I totally against that. 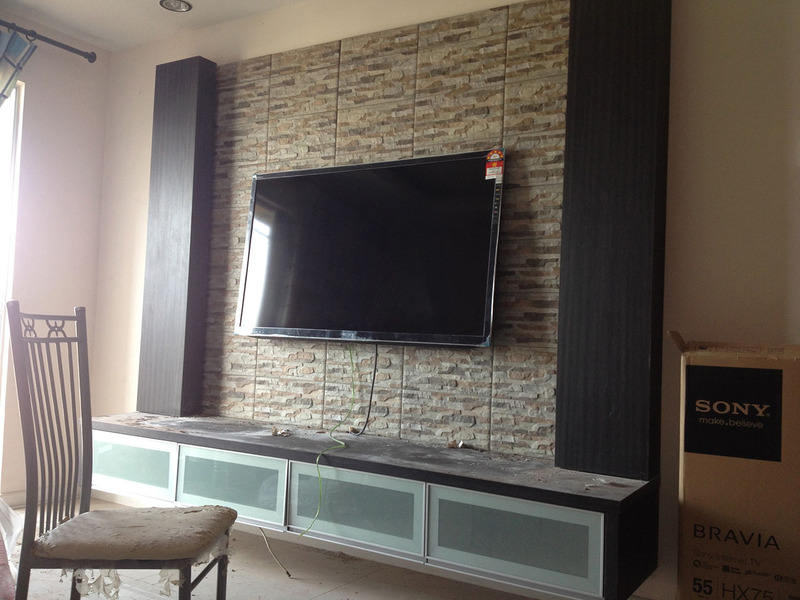 The reason why I go for this type of TV panel is because I want to have the rack hanged to the wall and the bottom of the rack to be hollow. Easier for me to sweep the dust that may have been collected under. Luckily that nothing was done on that day since after that I noticed that the furniture sent is not of the design that I choose. 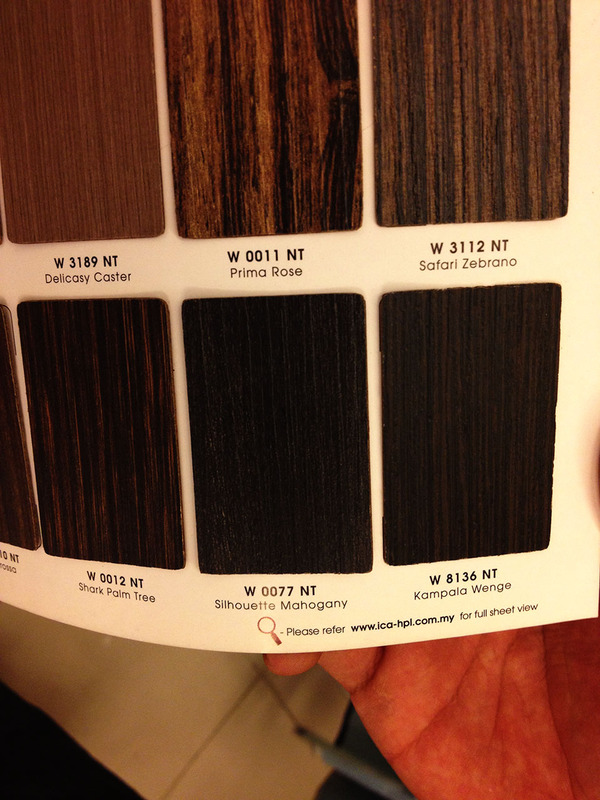 As blogged last time, this is the material that I choose – Silhouette Mahogany – where the surface is textured. But the one that was sent that day is a bit lighter in colour, with a flat shiny surface, and not textured one as I’ve chosen last time. 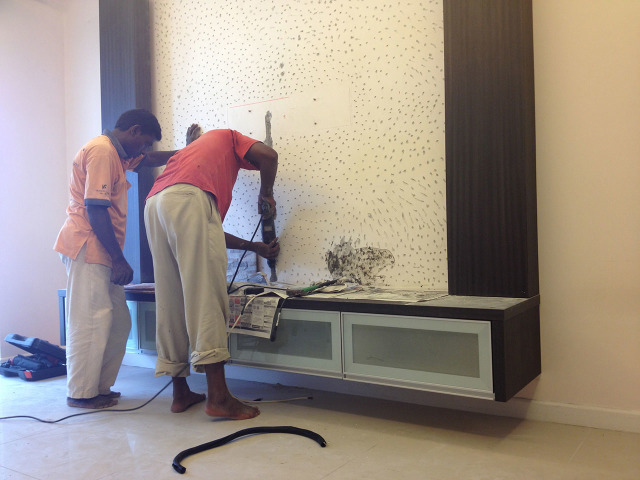 Calling the contractor, he apologized and admit the mistake, and he will be taking that back to the factory. 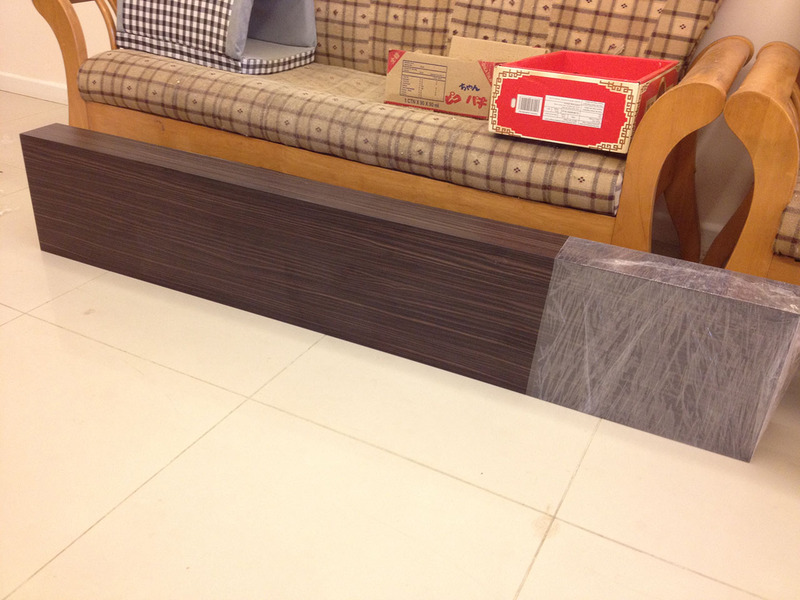 After various phone calls (the last one is a bit heated), finally, the correct furniture for the TV panel with the correct material is delivered to my house on June 30th. 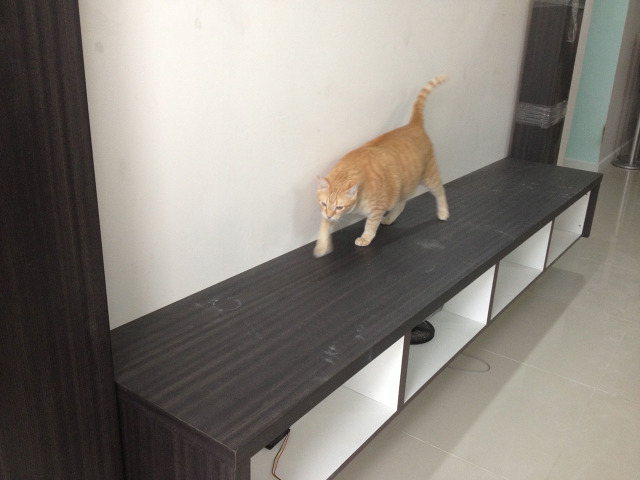 The rack is assembled and ready to be hanged to the wall while Oyen restlessly lingering around. There’s a few drilling needs to be done, but it’s Saturday where drilling is not allowed. Sorry neighbors. I have no choice but to allow this to go on. 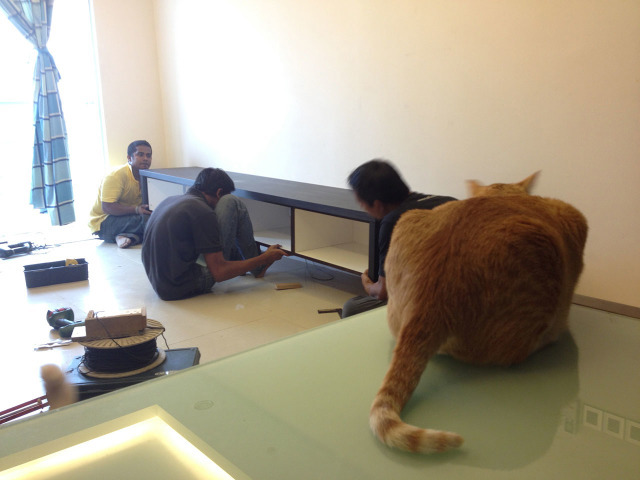 The work of hanging the rack to the wall begins, supervised by Oyen. It’s a brief one actually. Luckily no one complains. 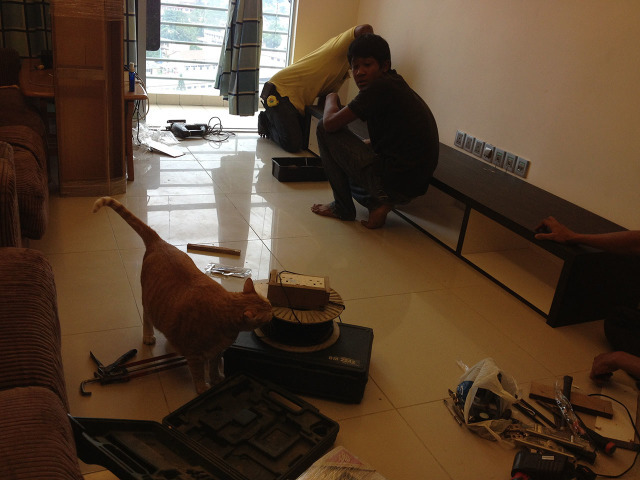 The rack has been hanged, and not it’s time for QC check by Oyen. 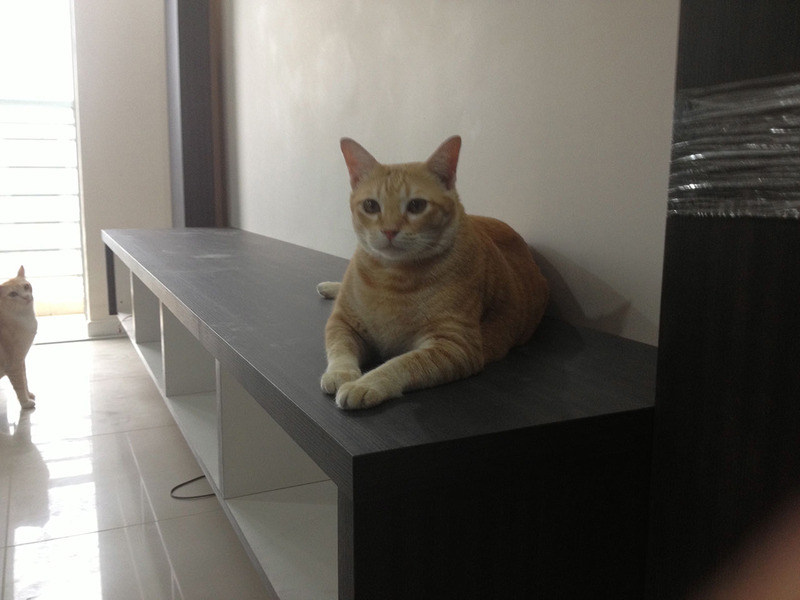 “Everything is fine” says Oyen, and verified by Ebot as well. This is how the TV panel looks so far, where the next step is for the wire-men to fix the LED lighting in the 2 pillar that will be put to the left and right of the panel. I think my contractor is having a resource and communication issue. 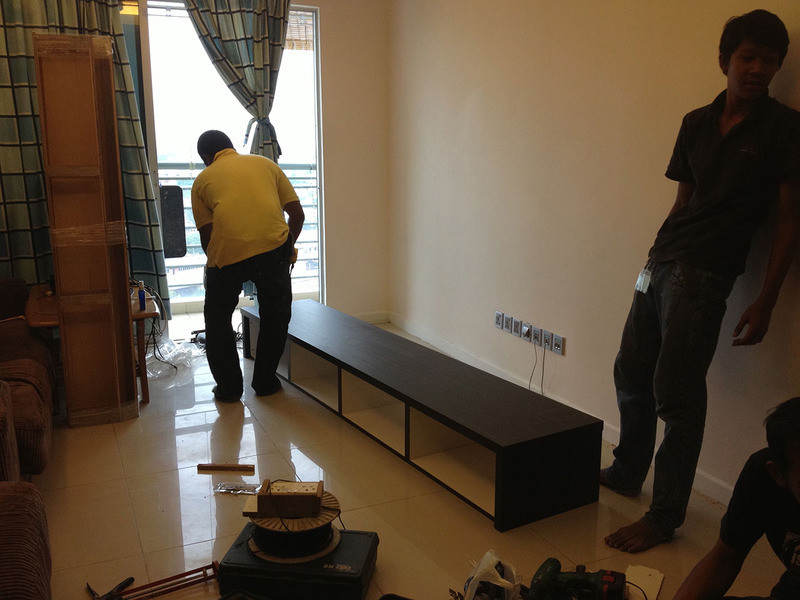 The wire-men did came several days after the rack is hanged to the wall, but they can’t do anything since a few holes still need to be drilled for the cable to go through. 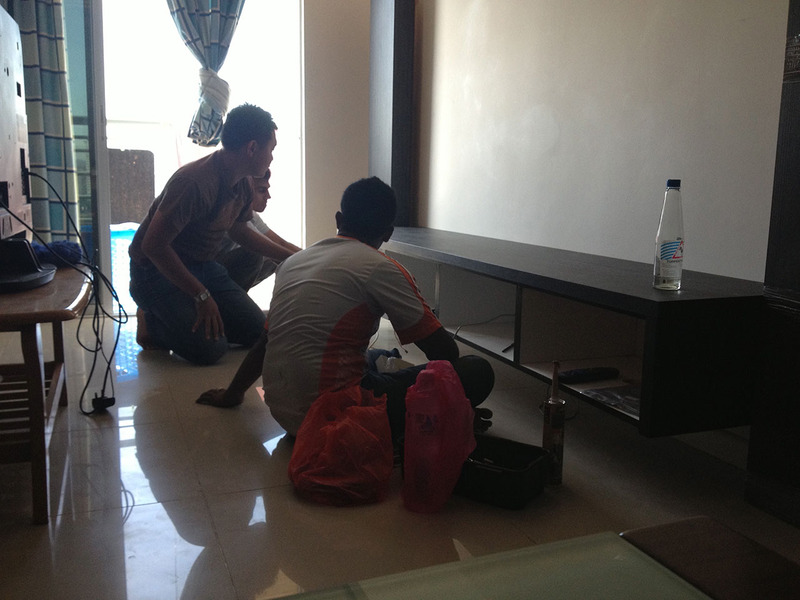 After another heated phone call, demanding the contractor himself to be here to see what other pending things that still need to be done by them, on July 7th, 7 days after the last work ever done to my TV panel, the contractor is finally here with the wire-men. 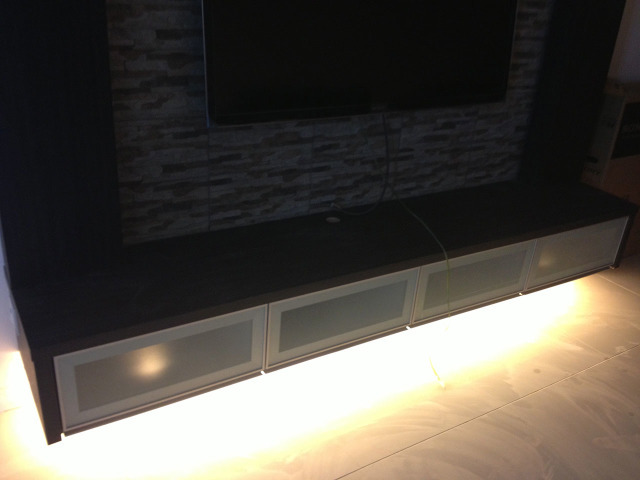 Then another phase of the TV panel construction has finished – installing the LED light in the side pillar, and securing it to the wall. Things are getting smoother now. 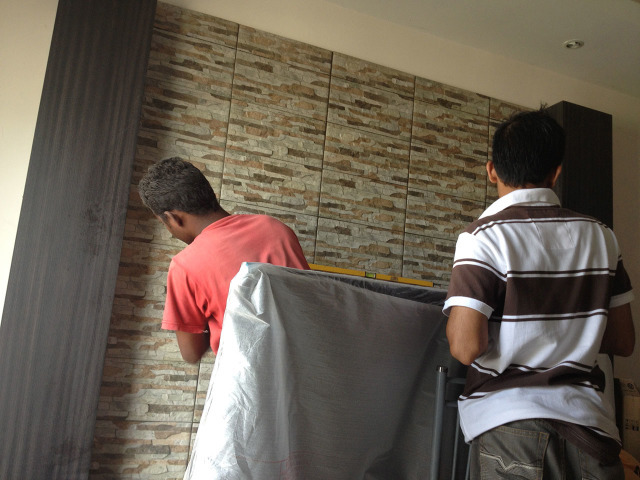 Yestarday, the contractor himself and the workers came to my house to do the final and the biggest part of this renovation of installing the tiles. Things will get really noisy and dusty from there, and I choose Monday since there will be a lot of drilling and sawing session, so that I won’t get a disturbed neighbor comes knocking on my door. 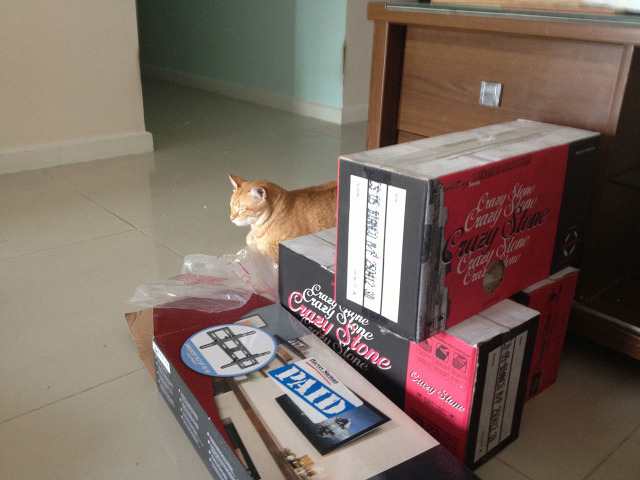 Oyen is getting ready with the materials that will be fixed today. The first step is to mark where the TV wall mount to be fixed. I’m using VMPL50A Tilting Mount from SANUS. From what I read, the brand is quite well known and the product is premium one. 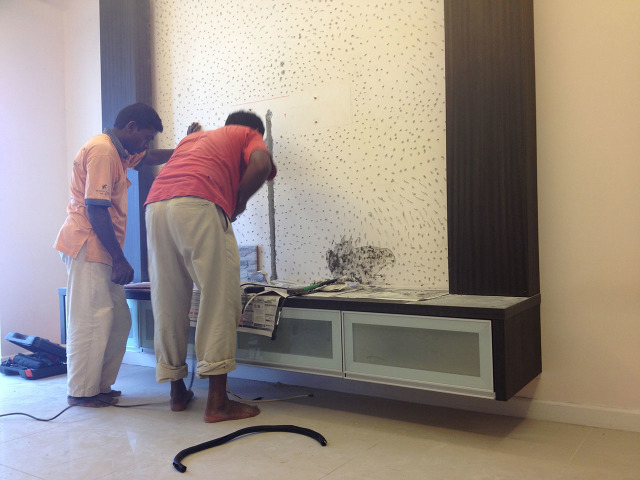 Once the TV wall mount placeholder has been marked, then series of holes were made on the wall. 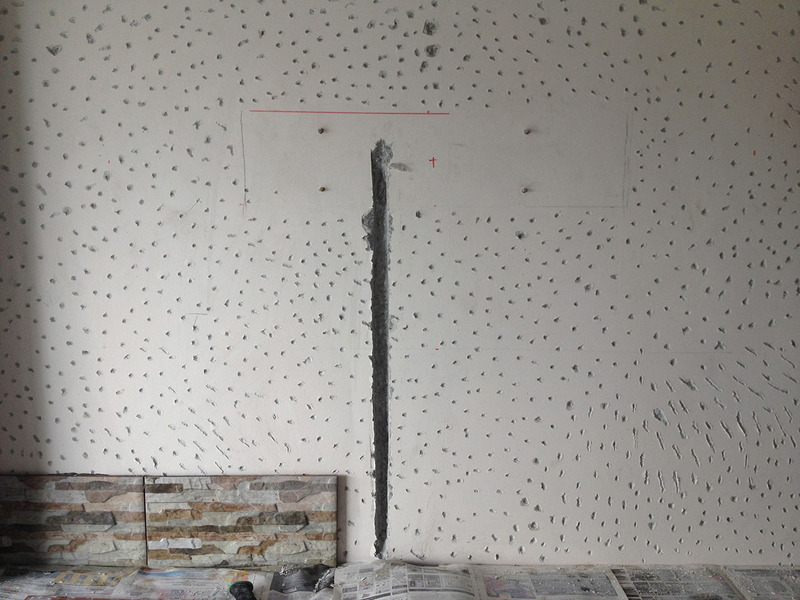 This is done so that the tiles that will be cemented soon have something to hold to (rather than having a flat wall). The hole for the conduit (to conceal the cables from the rack to the TV) is also been made. At this point of time, it feels like the ceiling will fall on my head. This is the final result from the drilling work done to my wall. Like what I’ve tweet, it’s so scary to see holes on my wall like my house has been damaged. Then comes the delicate part. Turned out that the power cord for my new TV cannot be detached like my previous model. 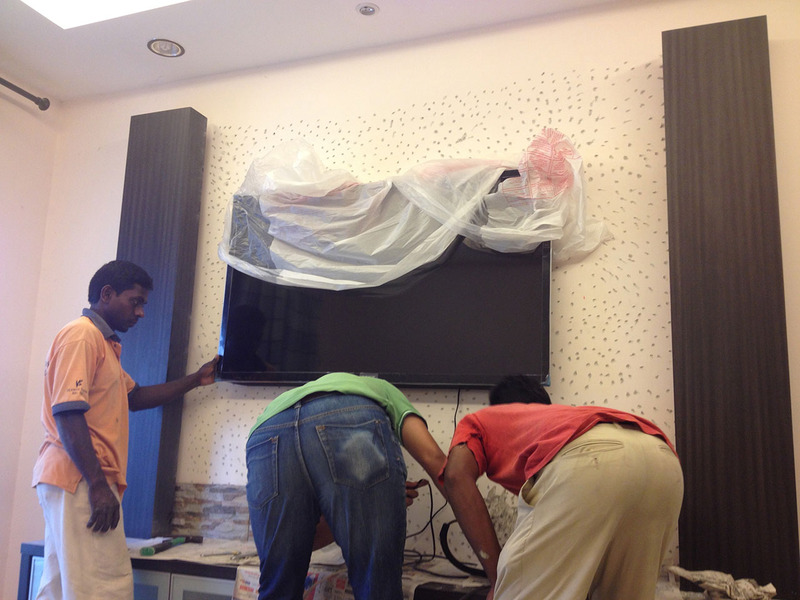 For that, the TV has to be mounted to the wall first before the power cable can be inserted into the conduit, and concealed in the wall. 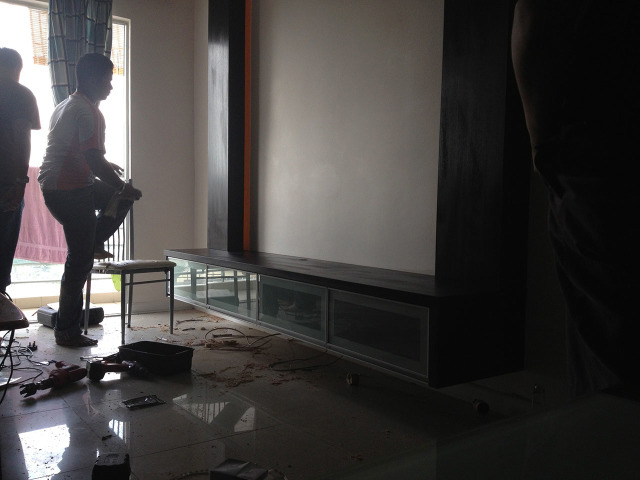 It such a heart-wrecking moment to see my new TV that just been taken out from the box got dusty all over during this stage, where some other minor drilling still taking place after that. The work for yesterday stopped there. 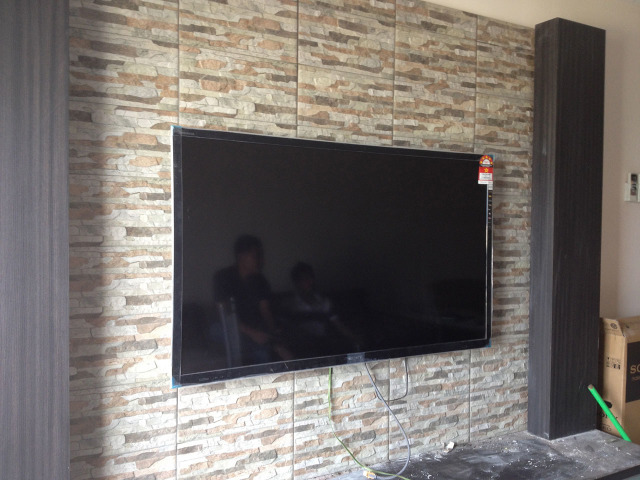 Today the final tiling work will be done, while the TV is mounted to the wall. Scary. 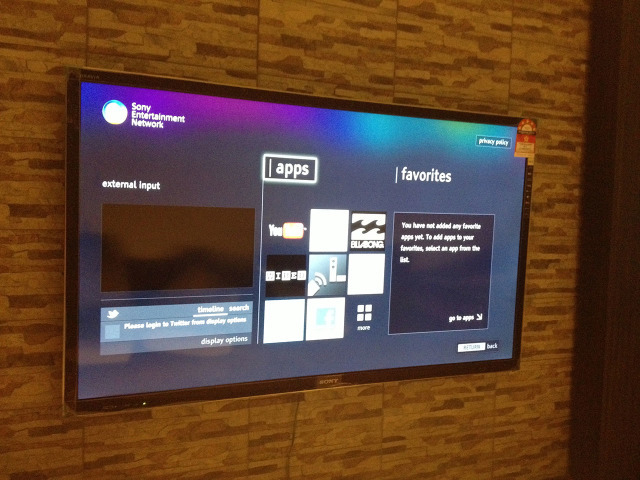 I just don’t understand why can’t Sony makes the power cord of this TV to be detachable. For this reason, someone has to stand and hold this TV while the tiling is done and I’m making sure that it is tightly wrapped. Finished at last. At first, I’m having a mixed feeling about my new TV Panel. It is quite far from what I’ve imagined it to be. My contractor is also suggesting for a T5 light to be installed underneath the rack. 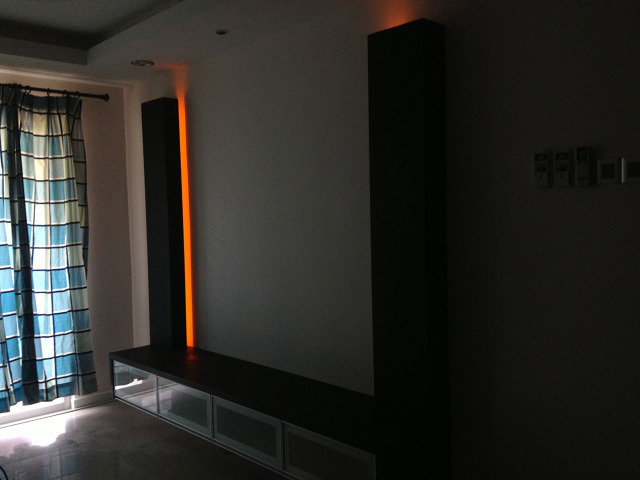 Luckily I have 2 extra 4-feet T5 flourescent lamps from my previous house renovation. After doing some clean up (vacuuming the dust from the drilling, wiping the rack top, dusting the TV), it’s the moment that I’ve been waiting for so long from the moment that my new TV is delivered to my house 1 and 1/2 month ago. It is switched on for the first time. This is how my TV cabinet looks like before. Been having that since I can’t remember when. Must be right after I moved to Mawar Apartment back in January 2006. 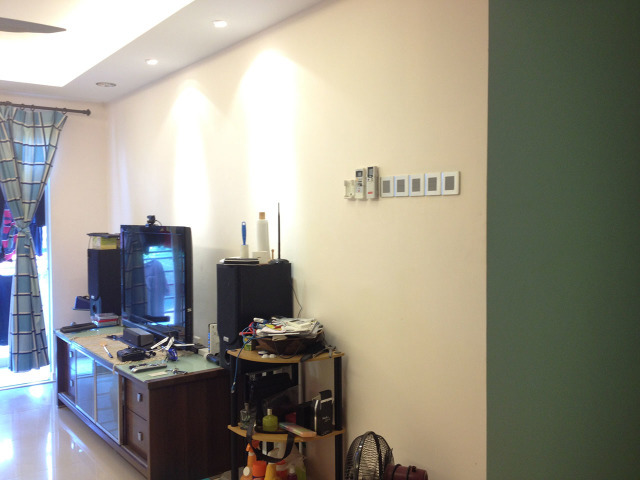 Well, after the area has been cleaned and the light is switched on, actually my new TV Panel is not bad looking at all. I guess I was too overwhelmed yesterday that makes me not liking it. Now, the wiring of my AV system can begin, and I can’t really wait to have my Yamaha DHT-810SPK500 Home Theatre System assembled. 😀 Lega bila dah siap… Nampak kemas! 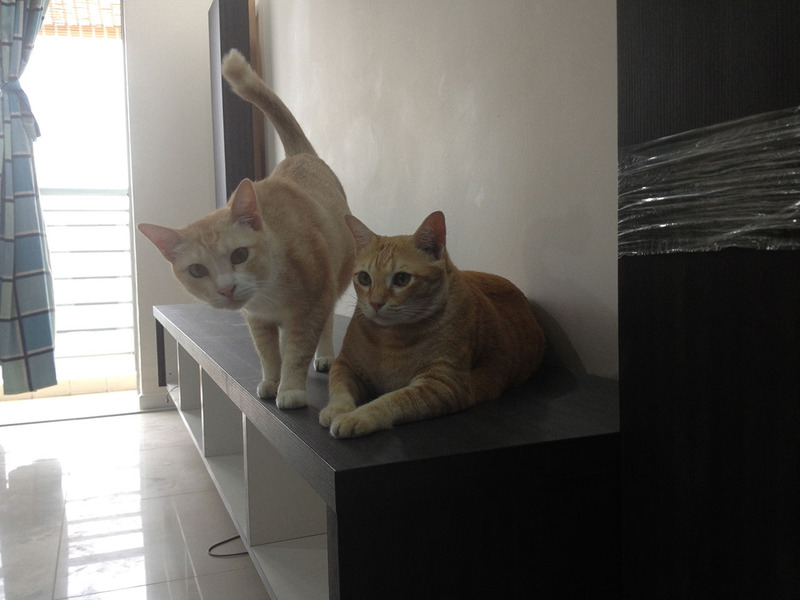 I am smiling whenever Oyen in action. heheheh. and waaaaaaaaaaaaaaaaaaaaaa…banyaknyerrrrrrrrrrrrr kerja!!!!!!!!!!!! hihi. oyen memang cam tu. time org nak buat keje, time tu dia menyibuk. imran.how much did the whole tv panel cost you? 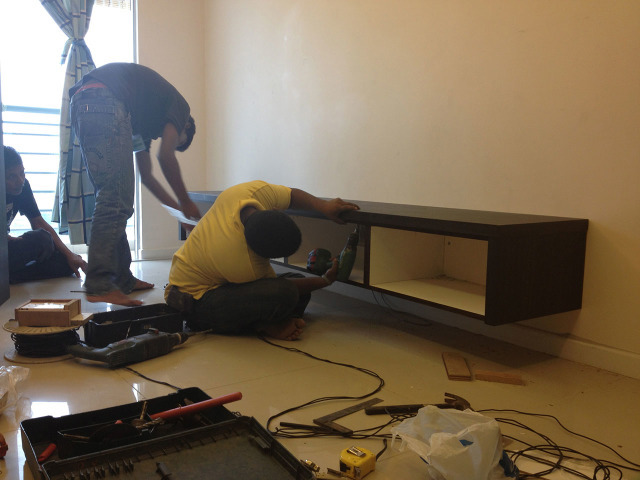 the labour work + rack costs RM3.4k. I bought materials myself (i.e. 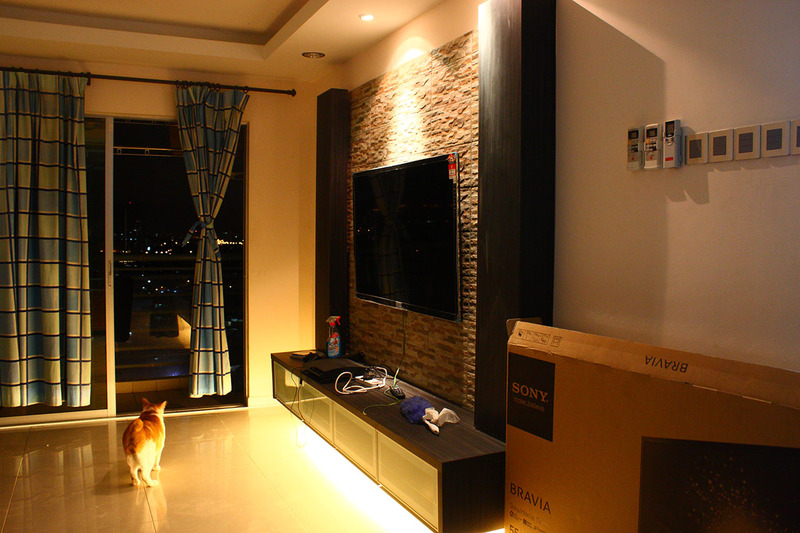 LED light, tiles, cement). i guess everything added up together it almost RM4k. 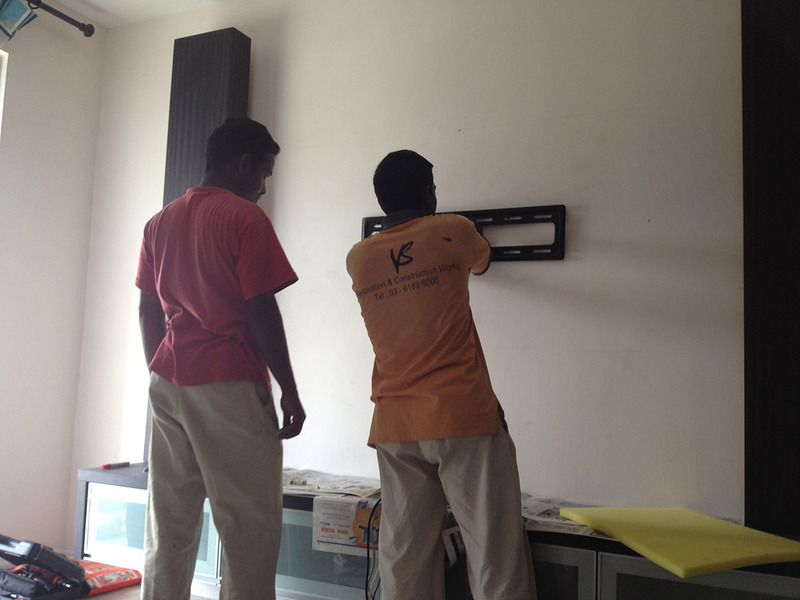 one more thing..in case there is a problem with the tv and need to send to service centre,do you have to hack the tiles to remove the tv? 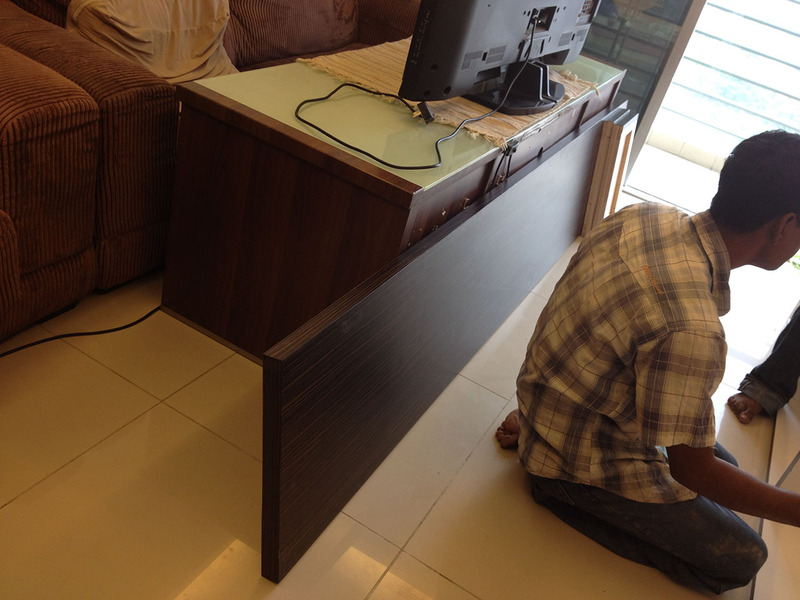 the tv is hanged on the tv mount. so it can be easily taken down from the wall. about the cable, i will can pull it out the conduit. there’s no need to hack the tiles again. but the conduit is quite narrow. putting back the cable after i pull it out can be tricky. i think there’s a way to detach the power cord from the tv. yg gambar last to Uteh. very rare tu. Uteh ni pemalu sket. jarang keluar klu ada tetamu dtg rumah. time construction tu memang dia tak keluar langsung dari bilik. keluar bila dorang dah balik je. tgh duk bayangkan ada air mengalir kat wall belakang tv fuhh..
Cantik..boleh share how much this sweer tv oanel costed u?sape kontraktor ye..